One November morning, Edith and I visited the Robert Frost Stone House Museum, currently maintained by The Friends of Robert Frost, in South Shaftsbury, Vermont. 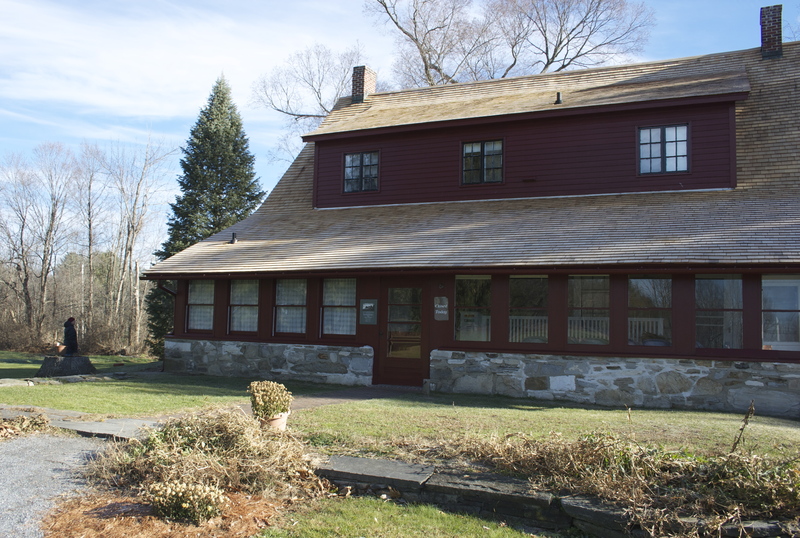 We had stayed overnight in nearby Bennington with intent to visit the Stone House Museum early in the day, all the better to avoid the schoolchildren who often tour the place on field trips. The parking lot was almost empty—a good sign. Then we noticed a small slate hung on a fence near the path to the house: CLOSED TODAY. The museum’s website hadn’t mentioned this change of schedule, so how could we have known? Edith and I stood near the car for a while and discussed our options. We could’ve come back some other time, of course . . . But South Shaftsbury is a nearly three-hour drive from our town, so it was frustrating to think we’d have to make another trip. Maybe we could have a look anyway? We walked up to the house, spoke with some of the contractors whose renovations had prompted the closure, and got their go-ahead to explore the grounds, at least. The house, built circa 1769, is fairly unremarkable despite its age. Two stories tall, it has a stone front and gabled ends. Double windows flank the centered front door. There’s a pointed dormer in front and a single, wide dormer with three windows in back. Brick chimneys rise from each end of the roof. The main roof slants down to a long, closed-in back porch with sashed windows and plaid curtains. The window trim throughout is maroon. 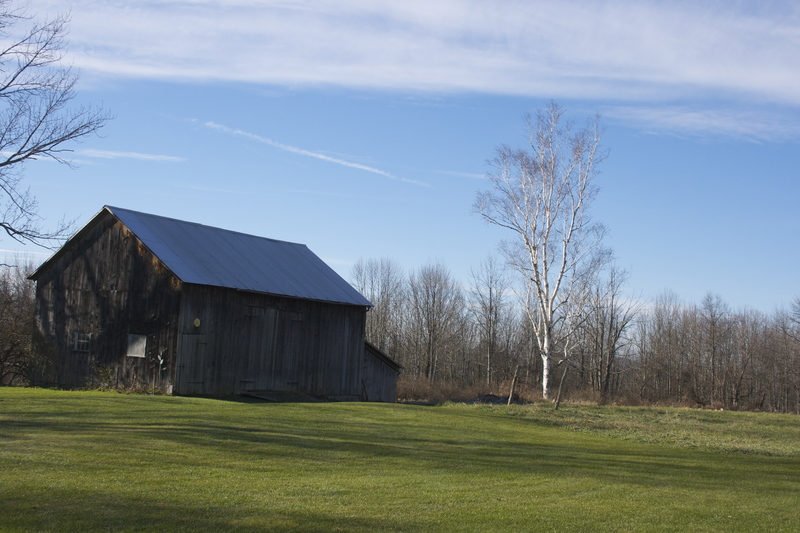 The back door opens out onto a small, stone-bordered plot of grass, then a much larger lawn stretching out toward a big gray barn, a single large white birch, and the woods beyond. Circling the house, Edith and I peered in through the windows, but we couldn’t see much, given the bright reflections on the window panes, and we didn’t want to annoy the busy workmen; then, feeling abashed to behave like a pair of literary peeping Toms, we left the house walked west across the back lawn toward the line of trees. It’s not as if I had necessarily expected Frost’s South Shaftsbury woods to be The Woods he described in “Stopping by Woods on a Snowy Evening”—the poet’s best-known poem and, for most of the Twentieth Century, arguably the best-known, most-beloved poem in America. I hadn’t even assumed that these particular woods were his inspiration. Surely the forest he described was a grove in his mind, not on his property. Even so, I wanted to see the property he owned during his decade in South Shaftsbury. I wanted to walk among the trees that Frost might have gazed upon through his kitchen window as he wrote early one morning in June of 1922. Edith and I followed the grassy path—once a road, surely—that took us away from the Stone House and its back lawn. 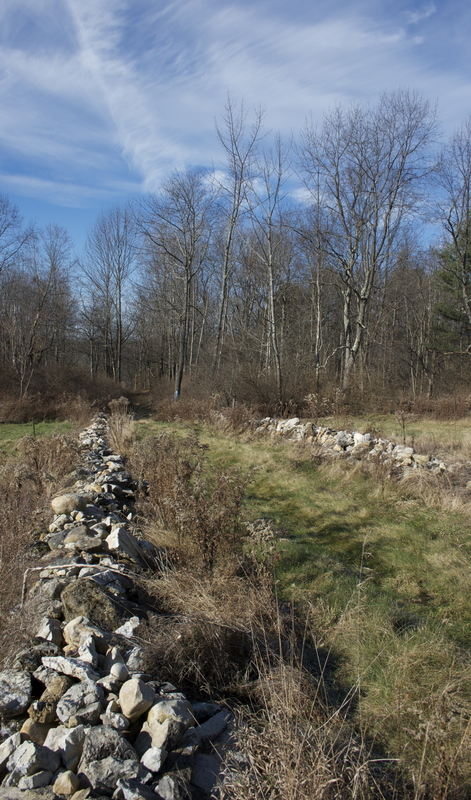 Parallel, dilapidated stone walls bordered the path, with rough meadow grasses rising alongside the rocks. This path declined for a hundred yard until it reached the forest. That morning, the trees were bare. Maple and birch dominated the forest, though I saw a few stout pines as well. What was most striking about the landscape was the thorny underbrush. Brambles rose both to the left and the right along the path and deep into the forest. Walking off-trail would’ve been possible but not easy or fun; pushing through would leave a hiker scratched and bleeding. Edith and I kept to the footpath, which was wide and fairly even. We proceeded for several hundred yards. The trail took us to the right, then started to decline. Many of the trees ahead looked damaged, with many ragged limbs dangling. We continued on the footpath, letting it take us gradually downward until it opened up rather quickly into a . . . swamp. I was struck at once by the unappealing nature of this forest—not lovely, not dark, not deep. In late June of 1922, following an entire night of writing at his kitchen table in the Stone House, Robert Frost realized that morning had come. “Having finished ‘New Hampshire,’” he wrote later, “I went outdoors, got out sideways and didn’t disturb anybody in the house, and about nine or ten o’clock went back in and wrote the piece about a snowy evening and the little horse as if I’d had an hallucination.” This experience of “piggybacking” one poem on another wasn’t unusual for Frost. “Sometimes one [poem] would grow out of an idea, leaving me relaxed. At other times the idea would produce a second growth, coercing itself as a Siamese twin on its predecessor . . . ‘Stopping by Woods on a Snowy Evening’ was written just about that way . . . But I must admit, it was written in a few minutes without any strain.”  Frost immediately recognized that he had written something unusual. In a letter he wrote to his friend Louis Untermeyer, Frost described this poem as “my best bid for remembrance”; it received widespread acclaim following its publication in 1923; and “Stopping by Woods” is arguably the best-known, best-loved of Frost’s works. Many generations of students have read it in their English classes; countless mourners have heard its last lines quoted at funerals; millions of people have cherished it; and millions of others have mocked it for what they perceive as its picture-postcard sentiments. What has amused and puzzled me about “Stopping by Woods” ever since I first read it as a teenager has been the disparity between the poem’s sunny reputation in American culture and its much darker substance. Perhaps this reaction is partly a result my habitual tendency to see the skull beneath the skin. It’s possible that one or another of the writers in my parents’ circle of friends—among them the American Studies scholar Stuart James, the novelist John Williams, and the poet Alan Stephens—pointed out the shadows in Frost’s snowy landscape. In any case, I’ve never felt inclined to see this poem as the dollop of maple syrup that many people consider it to be. Why do that comma (or its absence) and its implications matter? They matter for three reasons. First, because they reveal Frost for what he is—a writer far more interesting and complex than the benign, grandfatherly New England farmer celebrated in popular American culture. He is a writer whose portraits, both of the land and of people, reveal as much shadow as light. Second, they matter because this poem, like others among Frost’s finest, delivers an existential jolt. As Poirier states it neatly, “the woods are lovely and . . . their loveliness consists of being dark and deep.” The shadows have their own magnetic pull. One can resist their pull; one ought to; but it’s a mistake to deny the reality of this gravitational tug. Third, they matter because ultimately this poem shows that the woods—their loveliness, their darkness, their depth—aren’t external. The forest is a psychological, spiritual landscape. Regarding the nature of these inner woods, as manifested in countless myths, folktales, poems, stories, and dreams . . . well, I have more to say on that topic, but I’ll save it for a future post. Mertins, Louis. 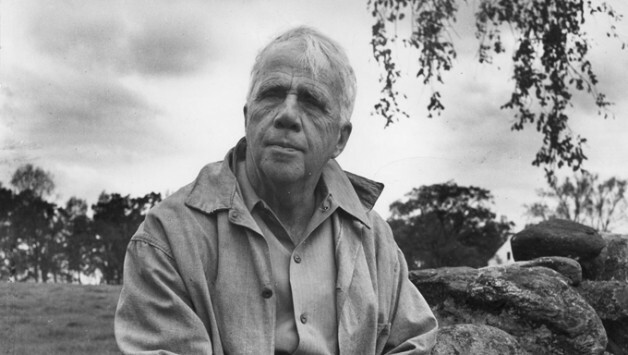 Robert Frost: Life and Talks-Walking. Norman: U. of Ok. Press, 1965. Pp. 81-82. Source: Tuten, Nancy Lewis; John Zubizarreta, The Robert Frost Encyclopedia (City: Greenwood Publishing, 2001), p. 347. Richard Poirier, Robert Frost: The Work of Knowing. London: Oxford University Press, p. 181. This entry was posted in Literary "Musements" and Amusements, Vermont History and Culture by Ed @ Montemayor. Bookmark the permalink.